Cardinal wins the NCAA central regional at Notre Dame! SOUTH Bend, Ind. - The second-ranked Stanford men's golf team shot a final round 274 (-6) to claim the NCAA Central Regional title by four shots over Florida State at the Warren Golf Course in South Bend, Ind. Stanford's 54-hole total of 830 (-10) was four strokes clear of the second-place Seminoles and eight strokes ahead of third place Florida (838; -2). Also advancing to the NCAA Championships from the Central Regional were Duke (839; -1) and LSU (847; +7). "We came in with the mindset that we wanted to win this tournament and we're excited that we were able to do so," said Stanford head coach Conrad Ray. "It was a great field and I felt it was one of the stronger regionals out there. We had a good vibe from the first shot we hit in the practice round." The Stanford players finished in the top-10, led by sophomore David Chung, who tied for fourth at 206 (-4). 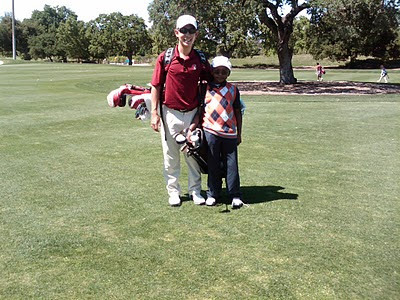 Chung finished with a 69 today and finsihed two strokes behind medalist Drew Kitteson of Florida State (204; -6). Steve Ziegler shot a final round 69 to finish at 207 (-3), good for fifth place. Junior Sihwan Kim tied for sixth at 208 (-2) after a final round 70. Freshman Andrew Yun recorded the best round of any of the Cardinal player today, firing a closing round 66 to climb up to a 19th place tie at even par 210. Senior Joeseph Bramlett tied for 39th at 216 (+6) after carding a 72 on Saturday. Stanford will join the field at the NCAA Championships, June 1-6 at the Honors Course in Chattanooga, Tenn., where it will be in search of its ninth national title. The Pac-10 will be well represented in the final NCAA event with 8 teams qualifying from the 6 regions. 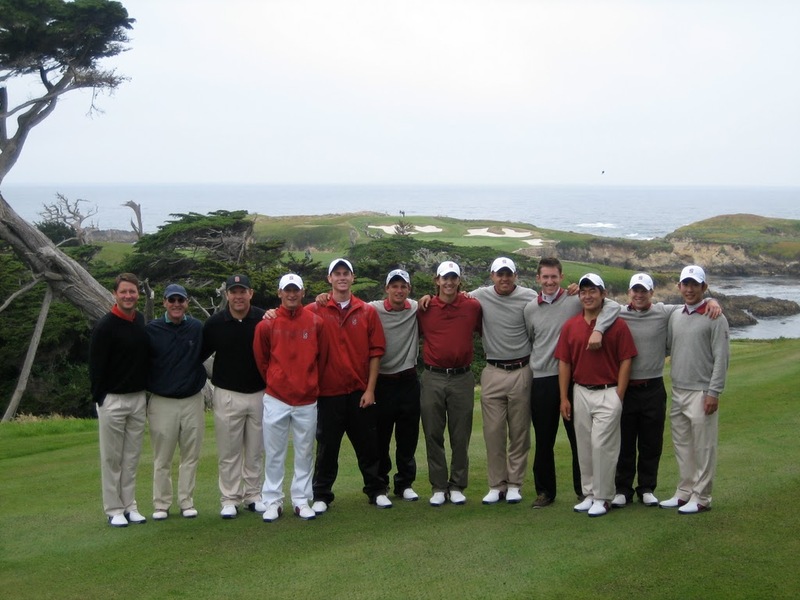 Play begins with Stanford's players teeing off starting at 8 am. The team consists of Joseph Bramlett, David Chung, Steve Ziegler, Sihwan Kim and Andrew Yun. Five of the 14 teams will advance to the NCAA Finals. "We have been assigned to Notre Dame's Warren Course. Here are the teams at our site by seed. 5 teams will advance to NCAA Finals. We will leave next Tuesday morning the 18th." Play will take place May 20-22. Nine Pac-10 teams have been assigned to the six regions with Oregon, Washington and UCLA also receiving #1 seeds. ASU and Southern Cal are #2 seeds, OSU is a #4 seed, Cal is seeded #6 and Arizona is a #9 seed. Washington State will be represented by an individual player, Kevin Tucker. Here is the NCAA site showing all the regionals with the seeded teams. The official NCAA website for the Notre Dame regional is here --- participant manuals are included on this website. Here is the Notre Dame Warren Golf Course site. The Finals will be held June 1-6 at the Honors Course in Chattanooga, Tennessee. Big news from the Cypress Point Club. Jordon Cox, a member of the Stanford Golf Team, shot a 63 and joined Ben Hogan, Jim Langley and Casey Reamer in sharing the course record. 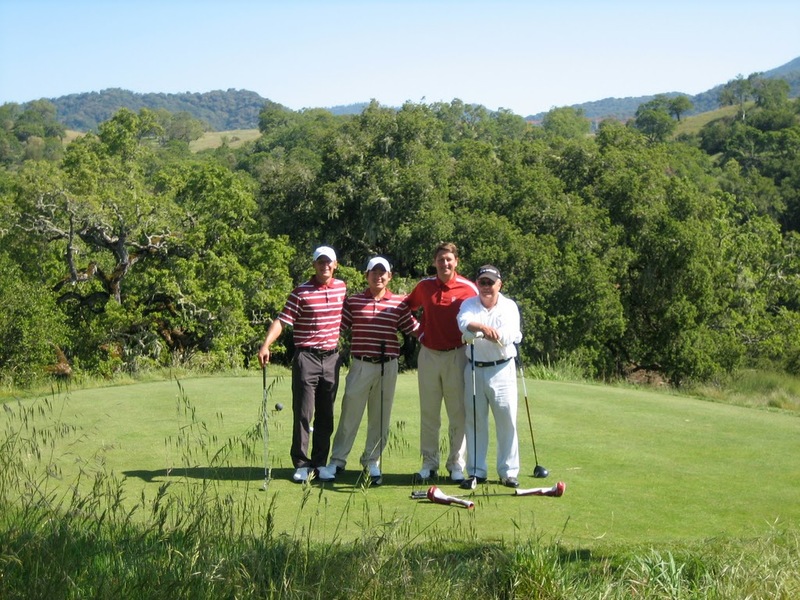 Coach Ray shares photos in a Picasa album (see link below) and a note from the team's recent play at Cypress Point and the Preserve in the Monterey area. 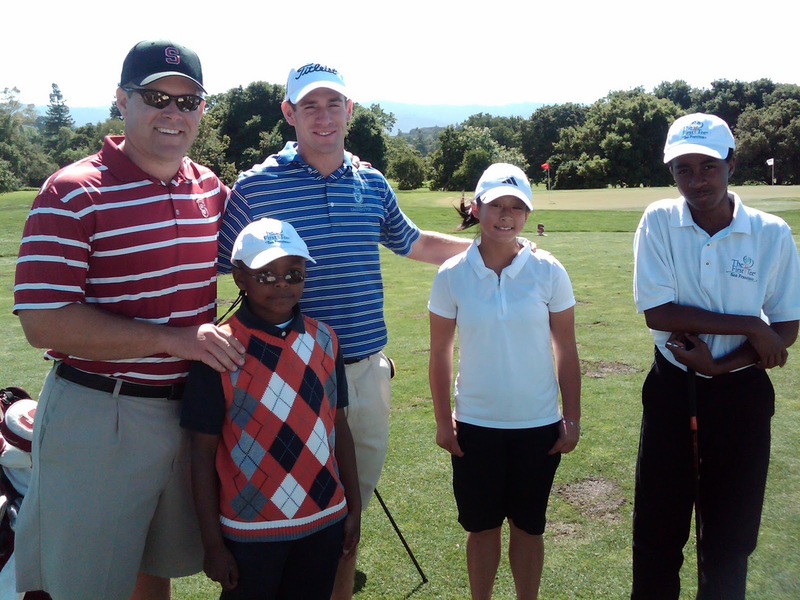 "We just got back from a great day at Cypress and the Preserve. Cox ties Hogan CR at CPC .... 63. Kearney fires back to back to back 66's. Good warm up for NCAA's!" Here's the link to the photo album. Coach Conrad Ray sends a few photos of a recent Saturday the team spent hosting First Tee kids. 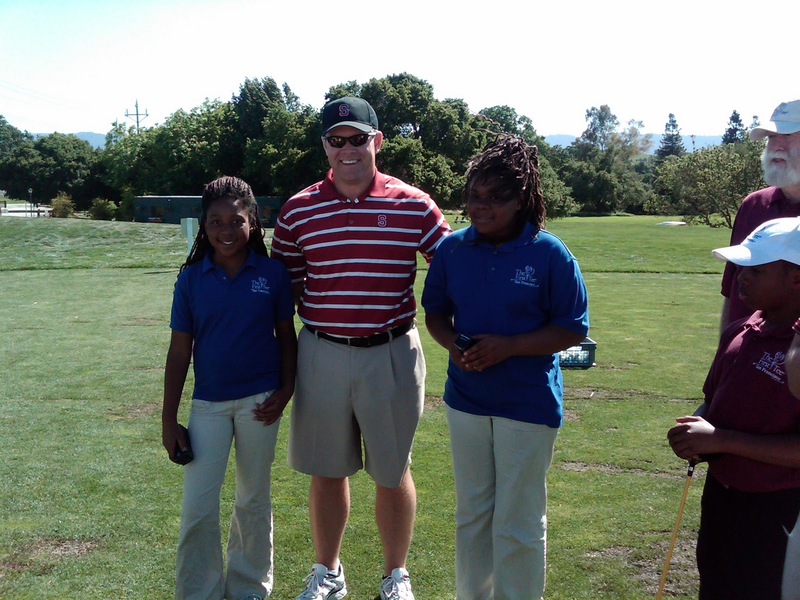 Rob Grube, recent winner on the Canadian Tour, joined in the fun. The Pac-10 announced it's all Pac-10 awards and five Cardinal golfers were honored this year including David Chung being named to the first team. Sihwan Kim and Steve Ziegler were named to the 2nd team while Joseph Bramlett and Andrew Yun were given honorable mention recognition. David has had four top-10 finishes in 8 events, including two third place results, and has a 71.2 stroke average which is second on the team to Joseph's 70.8 average in 4 events (Joseph missed the first five events due to injury). Here are the complete results of from the Pac-10 announcement. Pac-10 championship - "We finally got a taste of what we're capable up"
Stanford Daily article - April 30, 2010. Photo of Joseph Bramlett. Cardinal falls on final day despite big lead Stanford men’s golf hasn’t won a Pac-10 Championship since 1994, the same year that Tiger Woods was a senior in high school. After two days and three rounds in Tempe, Ariz. at the Karsten Golf Course, however, the team looked poised to end its 16-year drought. 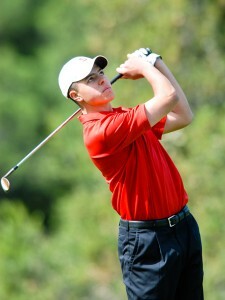 Senior Joseph Bramlett (above) was in contention for an individual Pac-10 championship heading into the final round. A score of 75 in that round doomed him to fourth place, five strokes behind the tournament's champion. The Cardinal was also strong in the individual competition. Senior Joseph Bramlett lurked two strokes behind leader Jesper Kennegard of Arizona State after shooting three consecutive five-under rounds of 66. The Cardinal was 35 strokes under par after two rounds, 13 strokes ahead of second-place Arizona State. The Karsten course features a desert layout with few trees and limited water hazards. For the first two days, the wind was a non-factor and left the course exposed to a lot of low scores. “It’s a course that really allows you to put the pedal to the metal and try to make as many birdies as you can,” Bramlett explained. On Wednesday, the winds picked up and Stanford failed to repeat the success of the first two days. Read the rest of this article.